The impact of Boeing 737 Max jets being grounded is likely to last a while yet as one airline is telling its pilots it expects the disruption to last into April at least. 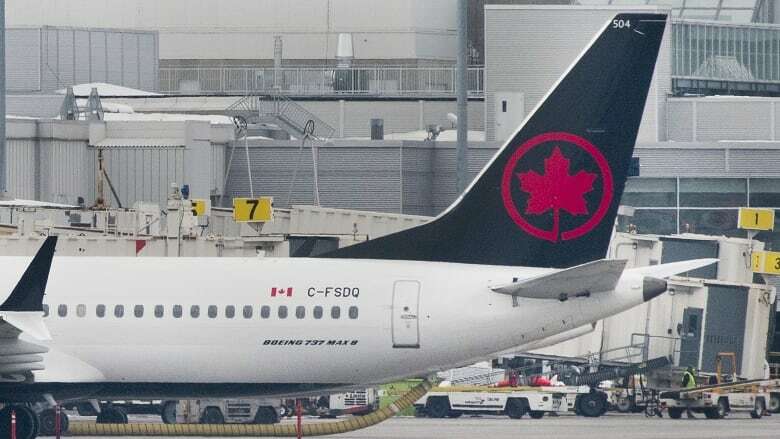 Transport Canada grounded all 737 Max jets from Canadian airspace on Wednesday, which threw a wrench into the travel plans for thousands of Canadians, and made a big dent in the route network at Canada's two biggest carriers. 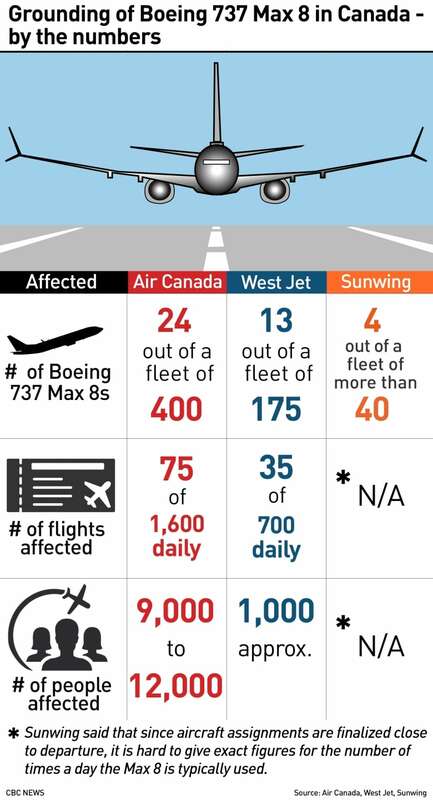 Air Canada and WestJet collectively own dozens of the jets that they can't currently use to fly their paying customers around. Air Canada spokesperson Angela Mah said the airline is working to "adjust our schedule with larger aircraft or additional flights where possible," including using different aircraft to service destinations in Hawaii, California, Mexico and some parts of Canada. The airline is urging its customers to be patient while it works through the temporary disruption. "We anticipated this possible outcome and have been working on contingency plans since the beginning of the week," reads a letter signed by CEO Calin Rovinescu addressed to the pilots and obtained by CBC News. "We are cancelling all flights on our Boeing 737 Max fleet for the next three weeks and we will continue to modify our plan and communicate to you and our customers as needed." The airline's customer service hotline, where passengers could theoretically call to get assistance, doesn't allow a caller to go on hold and merely refers them to the airline's website. "Due to unforeseen circumstances our call volume has temporarily exceeded out capacity to put you on hold," the message said. Under normal circumstances, about 75 flights a day use the Max jets, so losing a chunk of its fleet of that size is bound to disrupt the travel plans of thousands of Canadians. The airline still has 168 airworthy planes and is "working through the resulting cancellations which will continue to affect guest travel," Stewart said. If the prediction of a multi-week disruption comes to pass, passenger rights advocate Gabor Lukacs said, customers are entitled to much more help from the carriers than they are currently getting. He said it would be fair to give airlines until Friday to deal with the unexpected setback of having to replace that many working airplanes, "but from that point on, airlines should be paying passengers compensation for hotels, meals." "After 48 hours they should be having a plan on how to deal with this," he said. "They should have spare aircraft in place, possibly rented. So, I would encourage people to be patient until Friday, after that — the airlines' accountability becomes an issue." At Canada's largest travel hub, Pearson airport in Toronto, there was little on Thursday to suggest any chaos behind the scenes. Keethan Krish, who was en route to Austin, Texas, said he checked ahead of time to make sure he was not booked on a Boeing 737 Max. Even once he confirmed his flight was fine, "I just took precautions to come here early, in case ... things were hectic," he said. Kimberly Yetman Dawson, visiting family in Ontario, says she booked a second return flight to Halifax this Saturday at double the cost due to confusion over whether her original trip — scheduled initially on a Max 8 — would go ahead. Maninder Singh, the owner of InterSky travel agency in Montreal, said the Max 8 ban will cost him cash as he refunds money to passengers whose flights have been cancelled. Ryan Bond, Flight Centre team leader in Toronto, said rebooking clients is going a lot smoother than anticipated, even though it is one of the busiest times of the year with March Break. "We're able to work with their reservation systems, so we don't have to worry about contacting the airlines directly," Bond said. "We have all of the waiver codes that might be necessary to re-accommodate those clients." But for passengers stranded at Vancouver airport, getting home on Thursday is becoming a challenge. Samantha Calderbank from Orono, Ont., is on standby, waiting to get on a flight to Toronto after a week-long vacation with friends in Hawaii. "We're just hoping it [a plane] has room for five people," she said. Steven Parsons from London, Ont., said his WestJet flight to Toronto has been delayed by almost two hours, but he's still hopeful he can make it to Pearson airport in time to catch his 10pm EST flight to London. "Hopefully mine doesn't get cancelled," Parsons said. "But, I'm seeing others from Toronto getting cancelled, some from Calgary are getting cancelled."